September 9, 2014 - Ireland's low-cost airline, Ryanair on Monday signed an agreement with Boeing to purchase up to 200 new Boeing 737 MAX 200 (100 firm & 100 options). When finalized and all options exercised, this deal will be worth over $22 billion at current list prices. Ryanair is Boeing's lead customer for this new aircraft which will feature 197 seats (8 more than Ryanair’s existing 737-800s) and new CFM LEAP-1B engines, with combined aerodynamic improvements and improved fuel consumption by up to 18% and reduced operational noise emissions by 40%. 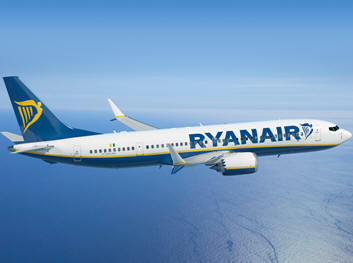 Ryanair reports these new aircraft will reduce the company's operational costs, these savings will be passed on through lower fares which the company believes with lower fares it will see passenger growth from 82m in 2014 to over 150m customers p.a. by the end of the delivery stream in FY2024. This new agreement was signed by Ryanair CEO Michael O’Leary, and Boeing Commercial Airplanes President and CEO Ray Conner, in New York on Monday monring. Following approval by Ryanair’s shareholders at an EGM in late November, this order will become Boeing’s largest ever aircraft order from a European airline. Ryanair enters into this new aircraft agreement, the day before it takes delivery of the first of 180 new Boeing 737-800 aircraft. The current 180 aircraft order will see Ryanair’s fleet grow from 304 to 420 (allowing for lease returns), and traffic rise from 82m last year to over 112m by 2019. Announcing the new Boeing 737 MAX 200 order, Ryanair’s CEO Michael O’Leary said “Ryanair is proud and honored to become the lead operator of Boeing’s “game changer” 737 MAX 200 aircraft which will expand our fleet to 520 aircraft by 2024 and create another 3,000 new jobs for pilots, cabin crew and engineers in Europe, while allowing us to grow traffic from 82m last year to over 150m p.a. by FY2024. "These new “game changer” aircraft will allow Ryanair to lower our costs and airfares, while improving our customer experience with more leg room and the Boeing Sky Interior, as we roll out new offers, particularly for our Business Plus and Family Extra customers. As many of Europe’s flag carriers cut capacity on short haul routes, Ryanair looks forward to using these new Boeing 737 MAX 200 aircraft to grow at many more of Europe’s primary airports."